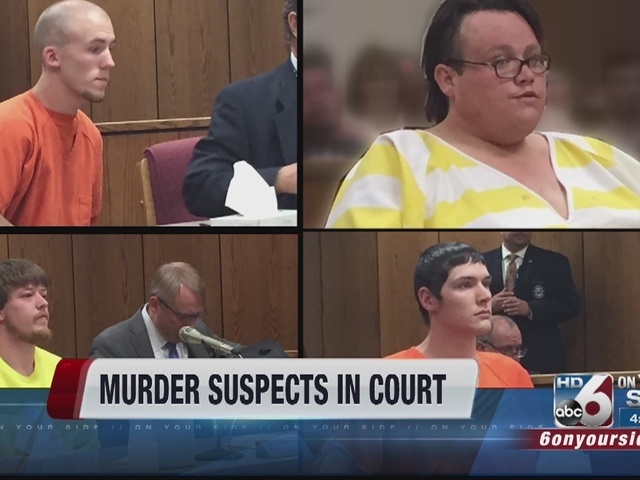 The four men charged with first degree murder in the death of 49-year-old Steven Nelson appeared in Canyon County court Friday for their scheduled preliminary hearings. 22-year-old Kelly B. Schneider of Nampa, 21-year-old Kevin R. Tracy of Nampa, 28-year-old Jayson C. Woods of Nampa, and 23-year-old Daniel A. Henkel of Caldwell are all facing charges of first-degree murder and robbery. Schneider is also facing grand theft and unlawful possession of a financial transaction card. Charges against Kelly Schneider have been dropped and re-filed. He will be re-arraigned Monday at 1:30 p.m. Prosecutors say this will allow them more time to gather witnesses and information for Schneider's preliminary hearing. Jayson Woods, Daniel Henkel and Kevin Tracy all waived their rights to speedy preliminary hearings, to allow counsel more time to prepare. Their preliminary hearings have been rescheduled for May 27, at 10:00 a.m. in front of Judge Gary DeMeyer. All suspects are still being held without bond. A memorial for the victim, 49-year-old Steven Nelson, is scheduled for 11:00 a.m. Saturday at Boise State University in the Barnwell room in the student union. The FBI is currently investigating the incident as a possible hate crime, looking into whether or not the suspects targeted the victim based on his sexual orientation, possible resulting in additional charges. The victim, 49-year-old Steven E. Nelson, was found naked and badly beaten in the early morning hours on April 29th while wandering a neighborhood near Gotts Point by Lake Lowell. He told police he was stripped naked, beaten and robbed. Steven died later at Saint Alphonsus Regional Medial Canter in Boise. Officials say Steven had, “broken ribs and bleeding from the ear. Steven died a few hours later, the Ada County Coroner cited the cause of death as homicide by cardiac arrest." According to prosecutors at the initial arraignment, Steven drove his vehicle with one of the suspects to the location near Lake Lowell. Prosecutors say when Steven and the suspect arrived at the spot, several of the other men who were already waiting "ambushed" him. When Kelly and Steven got out of the car, Tracy said that he witnessed Kevin hit Steven in the face and then proceeded to kick him with steel-toed boots “approximately 30 times” while he was on the ground. Steven was heard begging Kelly to not kill him and offered Kelly his credit cards and PIN number so he could be let go.